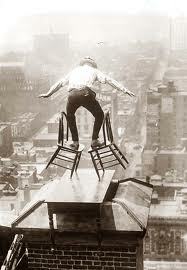 DIY Income Investor: Carry on Balancing (Government Bonds and Equities)! Carry on Balancing (Government Bonds and Equities)! The DIY Income Investor approach involves diversification and balancing of asset classes, including cash, bonds (both Government and Corporate) and equities. The good news (at least in the US) is that two of these asset classes are increasingly uncorrelated. In other words, they don't move in the same direction. This means that together they provide for a more robust portfolio. 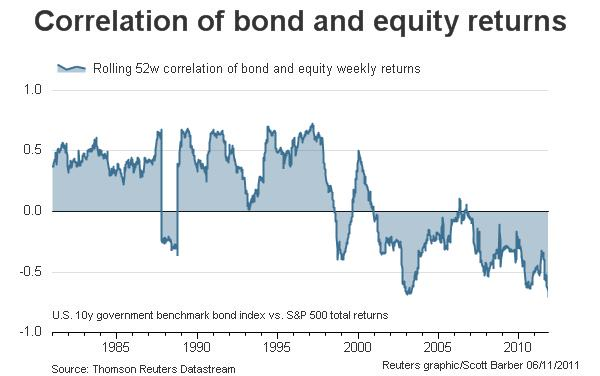 The Monevator blog recently identified an interesting graph (produced by Thompson Reuters) on the correlation of US Government bonds and equities. The graph indicates generally positive correlation (a 'bad thing' for us) up to around 1997, with negative correlation since then - in fact increasingly negative in recent years. I don't have any information on how the UK market is behaving in this respect but I suspect it is similar - with investors in equities being 'spooked' into seeking the relative safety of fixed-interest investments and thereby increasing the price (but reducing the yield, obviously). So, for now, I'll take that as a validation of holding both bonds and equities. Carry on balancing!